Comfy Sews vs Cozy Knits. Who am I fighting for? Well, we all know the answer to that. and root for the Sews as we duke it out! That is SOOO (or sew!) cute! Wow, I love this! So simple but really striking! Uhhh, that's kind of fabulous. I could make it this weekend, wear it over my gigantic protruding belly for a few days (hey, its called positive thinking)and then smuggle my moo-cow-bits around under it after that. And it would flutter nicely over my empty-baby-house tummy. Winner, winner, chicken dinner! Fantastic! I love the versatility and how it's drapey but still shapely. I'm linking up to your tutorial on my blog. I love this! ooo, I really really want to try this, it does looks so comfy and the details are just beautiful! I love this cardi. I'd recently been trying to figure out (in my mind) how to create a pattern like this. Thanks so much for figuring it out for me. By the way, I have some of that same ribbed knit. I love the moss green color. That is seriously cute...and I had to check what the post was about..I have been a Billy Blanks fan for over a decade! I think I'm addicted to your blog! I love your style and your tutorials are so easy to follow! You are so inspiring! If I wasn't working on making a card table playhouse for the girls for Christmas, I'd get right on this one. this is awesome! I bought like six "kilt-pins" a few weeks ago knowing that I would finf something to make that would need them - a here it is! thank you! So cute and versatile! And I love the color. I love the silhouette of this - lovely and simple all at once. Had to try it out, and the finished product is just as wonderful as I had hoped! Thank you so much for sharing. 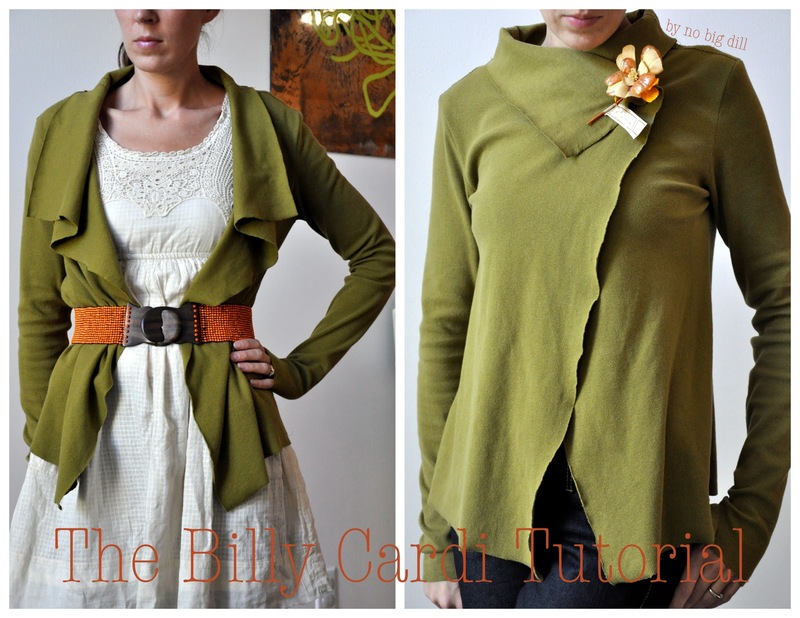 Here are some pics of the finished version http://stitchinglibertysbelle.blogspot.com/2010/11/billy-cardigan.html couldn't have made it without your great tutorial!